This is a letter that I emailed to: comments@nobelprize.org. So far, I have received no response. Perhaps any of you who care to re-send this letter might have better luck. If you hear back from the Nobel Foundation, please let me know! I am Dr. Richard O’Connor, M.D., a practicing physician in Helena, MT. I am writing because an enigma has recently come to my attention. This concerns an apparent relationship between 2 designs previously appearing as crop art in the crop fields of the U.K., and Nobel Prizes which were awarded for scientific work which these 2 crop designs appear to reference. In both cases, these crop patterns appeared in the fields 2-4 months before recipients of Nobel Prizes for scientific work to which these crop designs appear to refer were announced. These apparent relationships are illustrated in the diagrams below. White Sheet Hill Crop Circle appears to reference graphene. Illustration by Red Collie. Jubilee Plantation crop circle appears to reference electron diffraction pattern of a Ho-Mg-Zn quasicrystal. Illustration by Red Collie. 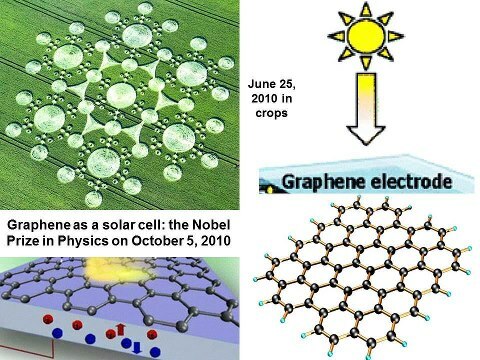 The upper crop design, known as “White Sheet Hill”, appeared on June 25, 2010 and appears to reference the graphene molecule and it’s potential application in the production of solar energy. Geim and Novoselov were awarded a Nobel Prize for their discovery of graphene later in October of that same year. 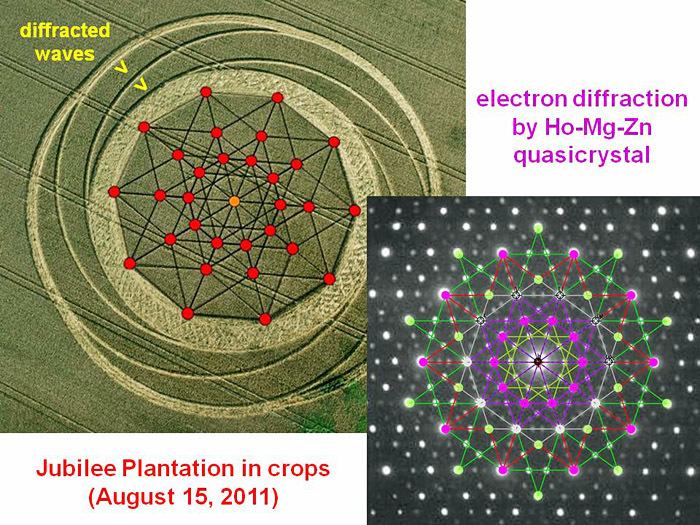 The lower illustration, a crop design designated “Jubilee Plantation”, was discovered on August 15, 2011 and appears to accurately represent the electron diffraction pattern of a Ho-Mg-Zn quasicrystal. In the original crop design, all lines shown in the illustration were accurately embossed into the crop, and the red dots precisely align with atomic positions previously demonstrated in a Ho-Mg-Zn quasicrystal. Dan Shechtman was awarded the Nobel Prize for his discovery of quasicrystals later in October of that same year. I find these apparent relationships quite curious. Is it possible that those who created these crop designs could have had foreknowledge (inside information) regarding who would be awarded Nobel Prizes in science in 2010, and again in 2011? I am wondering if you might comment about who might have had access to this information, how they might have known this, and when they could have known which scientists would be selected as Nobel Prize recipients in 2010 and in 2011? Are candidates who are under consideration to receive a Nobel Prize publicized as each year’s selection procedures move forward? If so, where is this information published, and who would have access to it? In June, 2010 and in August, 2011, how many individuals would have been on that summer’s “short list” as potential candidates, assuming that the Nobel Foundation retains those records? Any clarification regarding these questions would be very much appreciated. Thank you for your time.